We at Enjoy-Morocco Tours provide a variety of inspiring and informative professionally Marrakech guided trip and tours daily through many destinations across Atlas mountains, and Sahara Desert. All of the Marrakech private tours listed below are move along at a leisurely pace. Day 1: Marrakech - High Atlas Mountains- Ait Ben Haddou- Skoura - Valley Of Roses - Dades Valley. Enjoy Morocco team organise Marrakech Atlas & Sahara tour with experienced drivers and local friendly guides. Your private Morocco tour driver will pick you from your hotel and we start the tour towards Dades Gorges. We cross High Atlas Mountains with its beautiful landscapes and we visit some of Berber villages along the way to Ait Bnehaddou. Here we visit UNESCO world heritage site - Ait Benhaddou Kasbahs which is a spectacular kasbah with famous movies as The Mummy, Game of Thrones and others. After visiting the Kasbah we continue to Ouarzazate then Skoura and , we’ll head to Dades Valley for overnight in local kasbah with dinner. Day 2: Dades Valley- Todra Gorges – Erfoud – Merzouga. After breakfast, our adventure Marrakech tour - 5 days travel continues with exploring Dades Gorges, then we drive for about 1 hour to reach Tinghir and we explore Todra Valley in short hiking trip. We will travel to Tinijdad, then Erfoud and we explore the capital of fossils. We reach Merzouga village where we stay overnight in local riad or kasbah with dinner. 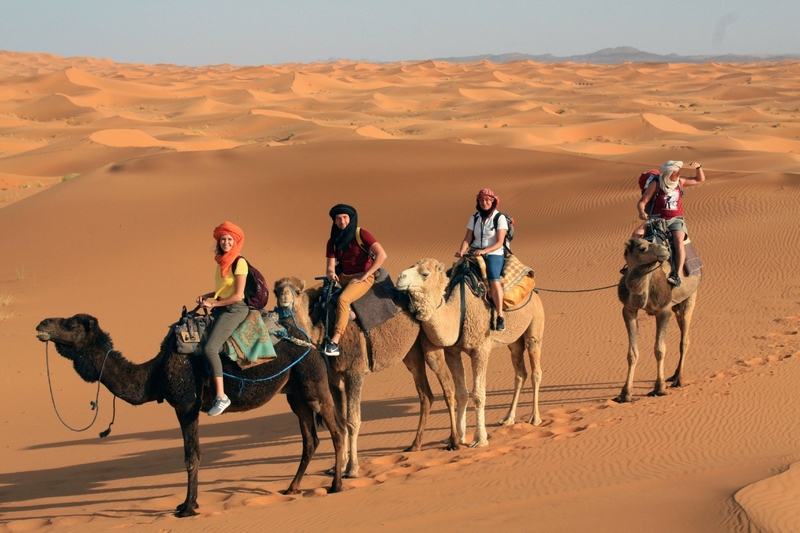 Day 3: Explore the Sahara Desert in Merzouga With Camel Ride. After waking up our 5 days 4 nights tour to Sahara desert in Merzouga continues and we explore the Sahara in guided excursion. 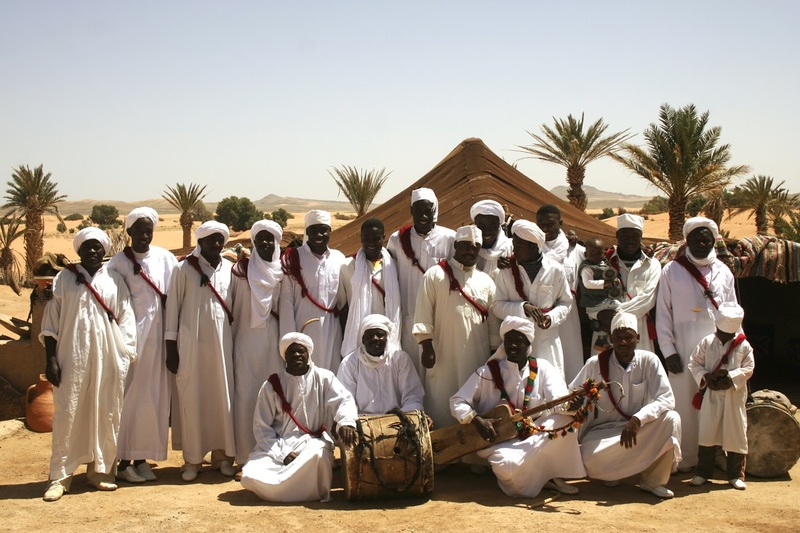 We visit Khamlia and its Gnawa music with local people, listening to their music. Then you visit Nomad musem in Hassi Labiad, we explore desert dunes in 4x4 excursion. Later we prepare for camel excursion across Erg Chebbi dunes to reach desert camp. After dinner you listen Berber songs in camp. 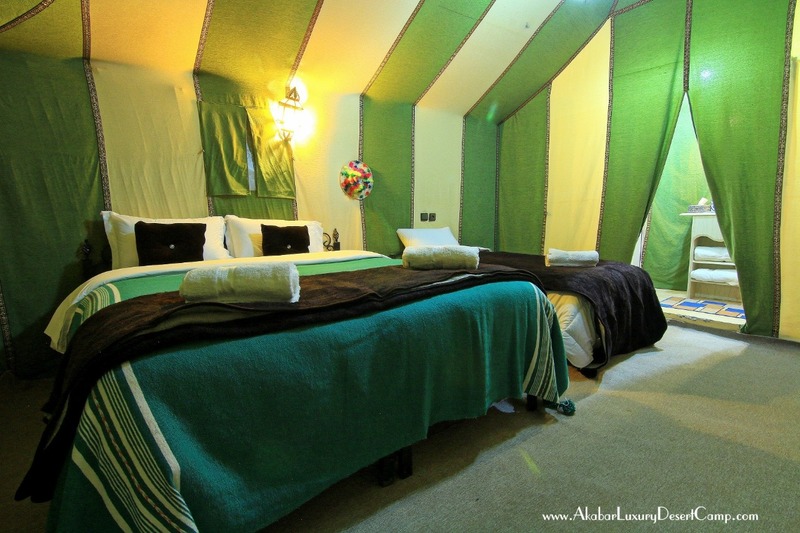 Overnight in comfortable tents in Sahara. Day 4: Merzouga Trek - Daraa Valley- Ouarzazate. After breakfast, we ride camels to village, then we’ll drive to Rissani, here we visit the biggest local markets in the area. We travel via Nkob and Draa valley (the biggest valley in the south-east of Morocco) to Ouarzazate (often called as the Hollywood of Africa). We spend the night with dinner in local kasbah in Ouarzazate. Day 5 : Ouarzazate to Marrakech (through High Atlas Mountains).